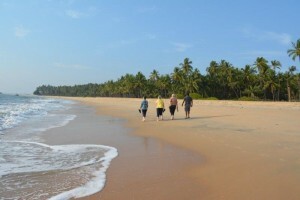 Enjoy the spectacular beauty of Southern India by touring through Karnataka and Kerala. Your tour will take in wonderful historic sites, spectacular wildlife and beautiful tropical beaches as well as the backwaters of Kerala. Your driver will collect you at a convenient location and your adventure will begin. On route stop at the Tipu Sultan’s summer palace and his mausoleum and learn about this colourful character. Visit the Chamundi hills and view the historic Hindu Temple at the top. View the ancient statue of Nandi (the bull) carved from the hillside rock. Have lunch at your lodge before taking a jeep safari into the national park. Nagarhole offers good tiger, leopard and elephant sightings as well as many other animals. Travel over the Western Gatts to the Kerala coast. enjoy the beach which is often deserted, and the sea temperature is 27C. A wonderfully relaxing place to be. Other options include historic sites nearby. The first Europeans came to this area in around 1500. Travel to your luxurious accommodation, complete with swimming pool, just outside the National park. All meals are included in your package. Enjoy the spectacular scenery of this hill station with tea plantations as far as the eye can see. Visit the tea museum and watch the production process and learn about the different types of tea..
Stop at a spice plantation on route. It is amazing the range of plants that can be grown in the wonderfully productive climate. Treat yourself to some fresh spices to take back home. Check in to your Homestay on the banks of the backwater canal. Day 21 to Day 23: Ernakulum. Travel in to Ft Cochin for a tour of the old city. Including a visit to the church where Vasco Da Gama was buried. A car and driver from day 1 to day 17 (after that your home stay host will arrange transport for you). Your driver/ guide will support you throughout the trip and ensure everything goes smoothly for you. He will find restaurants, guide you through shopping trips, provide background information etc. Boat ride in Periyar National Park. 50% deposit must be paid at least three months before the trip starts. Later bookings may not be possible (particularly to the parks) and will incur extra cost.